Photographer unknown, turning back shirt sleeves, courtesy Clothes & Quotes blog site. Perhaps because cuffs are so ubiquitous in our culture I totally missed the point of the shaped extension on Manchu robe sleeves when I first focused on them back in the 1970s. Emperor’s silk tapestry with silk and gold-metallic thread semiformal court coat (jifu) about 1770, Museum of Fine Arts Boston, William Sturgis Bigelow Collection 11.3985. 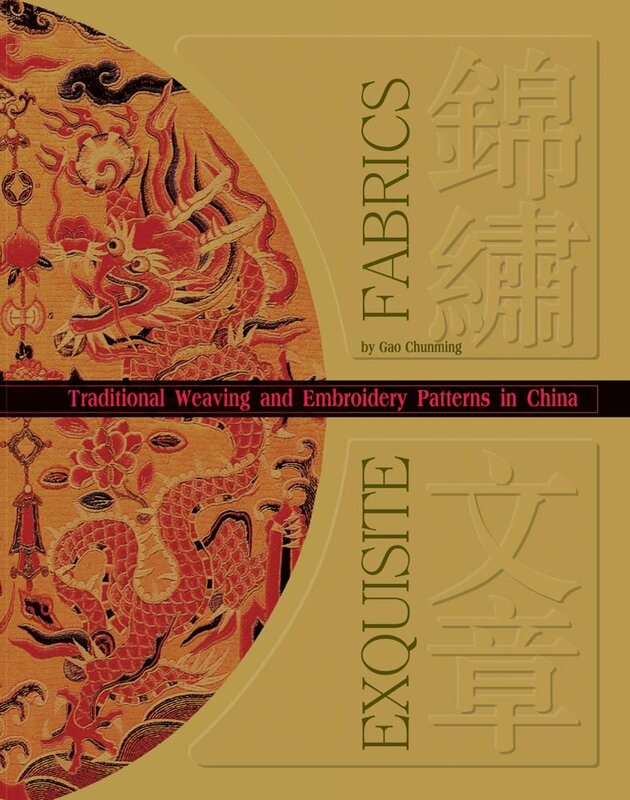 These prominent features of Manchu and Manchu-styled garments cannot be missed. They were even given a special descriptive name: mati xiu (马蹄袖 literally: horse hoof cuff). On many robes attention is drawn to them and to the particular shape of the front overlap and its fastenings by making them from a separate contrasting fabric. Cuffs and facings from a set of yardages for an emperor’s embroidered satin semiformal court robe, about 1790. Shenyang Palace Museum. Nonetheless, I got wrapped up in the scholarship of the history of Chinese imperial dress and how the Manchu, who came to power in the 17th century and established the head of the Aisin Goro clan as emperor of China in 1644. 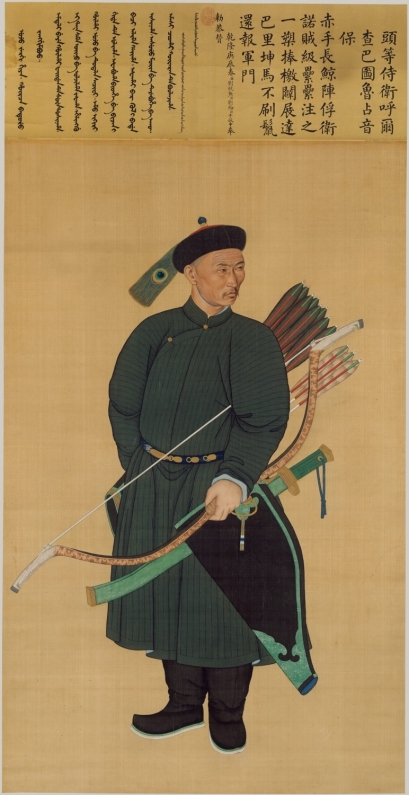 Unidentified artist (Chinese), Portrait of the Imperial Bodyguard Zhanyinbao, dated 1769, ink and color on silk, 130 1/2 x 46 3/8 inches, Metropolitan Museum of Art, Purchase Dillion Fund Gift 1986.206. The rapid growth of the Manchu state during the early 17th century resulted in a patchwork of expedient decisions that built identity and solidarity. 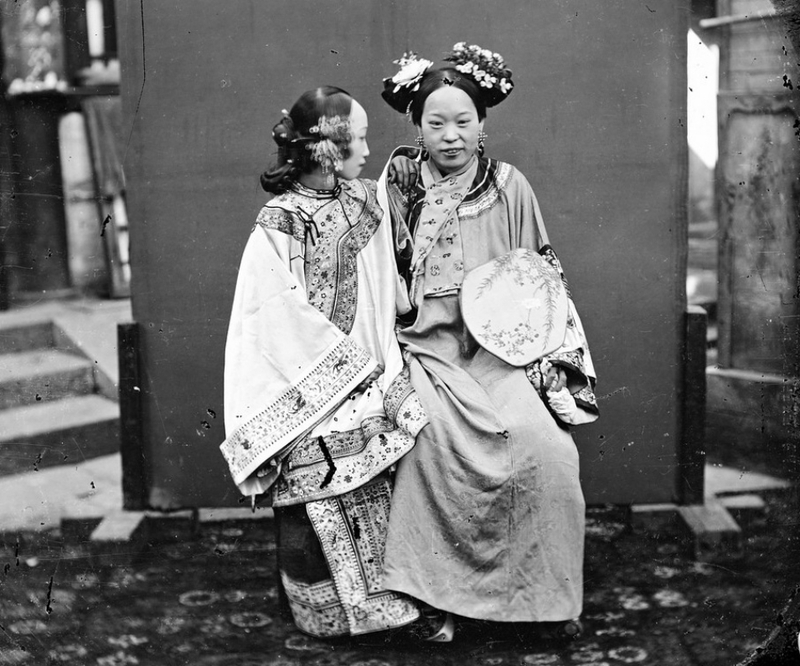 From the proclamation of the Qing dynasty in 1636, a guiding principle concerning dress was to avoid adopting the traditional dress codes of the Ming dynasty. At that time the Manchu state was identified by equestrian archers and the Aisin Goro leader reminded his followers if they rashly adopted the customs of the Ming (Han-Chinese) people, they would become unfamiliar with the bow and arrow, thus losing their martial preparedness. This has been a familiar trope in China’s dynastic history since the 4th century BCE when the king of Zhao ordered his army to wear the attire of the Hu (i.e. 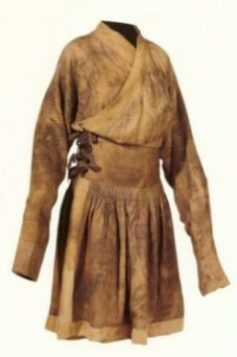 barbarian dress that included trousers). One hundred years after the Manchu conquest, the Qianlong emperor would reiterate the warning by noting that every northern dynasty that changed to Chinese robes and hats died out one generation after abandoning their native dress. Another factor involved the Mongol tribesmen who attached themselves to the Manchu enterprise in the early 17th century. The Manchu were certainly aware that the Mongols under Kublai Khan established the Yuan dynasty in 1271 and ruled over an empire extending from Mongolia to South East Asia and from Korea to Tibet. At that time the fore-bearers of the Manchu were subservient to Mongols. 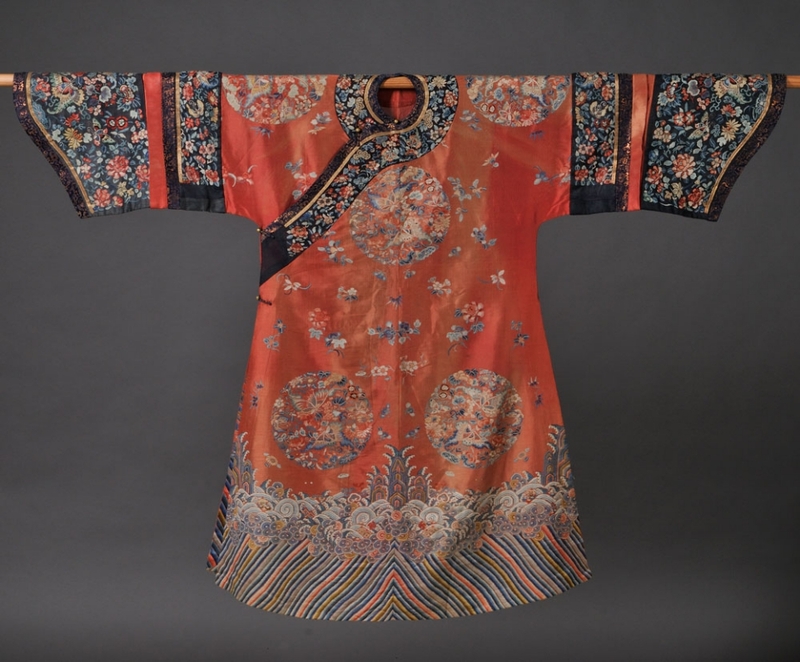 It was a priority for those developing the Qing dynasty wardrobe that it should reinforce submission to the authority of Manchu imperial clan. Manchu propaganda utilized dress to create a backstory, suggesting a history of warrior culture, which was distinct from that of the Han Chinese or the Mongols who had each established imperial dynasties. After the conquest the Manchu imposed their dress on all males serving in the government regardless of ethnicity. This included the distinctive hairstyle that shaved the front of the head and plaited the long back hair into a single braid known as the queue. 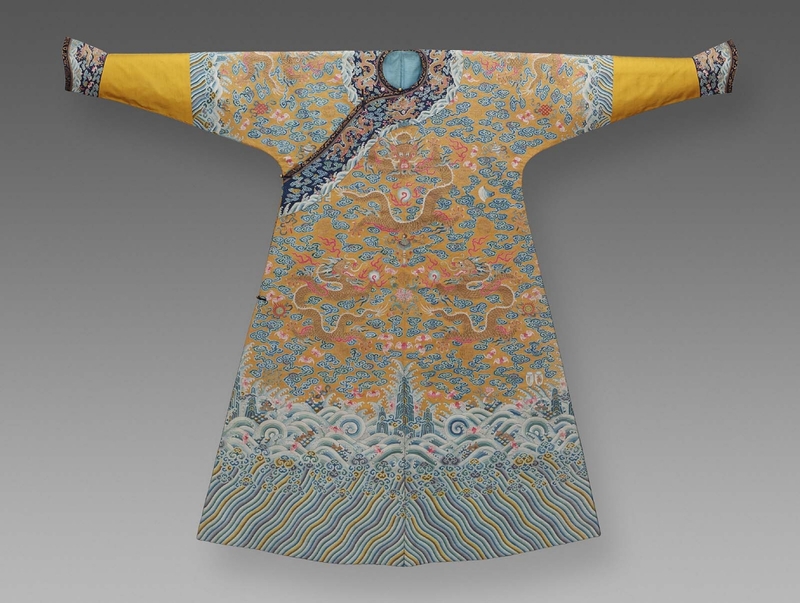 The long tapered sleeves that facilitated the use of bow and arrow can be seen as a reaction to the long full sleeves of Ming dynasty official robes. Silk damask court robe (insignia missing), late 15th or early 16th century, Myrna Myers Collection, Paris. 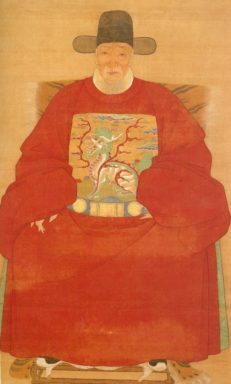 Artist unknown, Portrait of a censor Ming style, probably dating from 18th century, hanging scroll: ink and color on silk, 148.3′ x 90.5 cm. Art Museum of Princeton University, The DuBois Schrank Morris Collection, C1947-164. The lute-shaped front overlap was another Manchu innovation that distinguished the appearance of their coats from similar form-fitting coats developed by the Mongols. 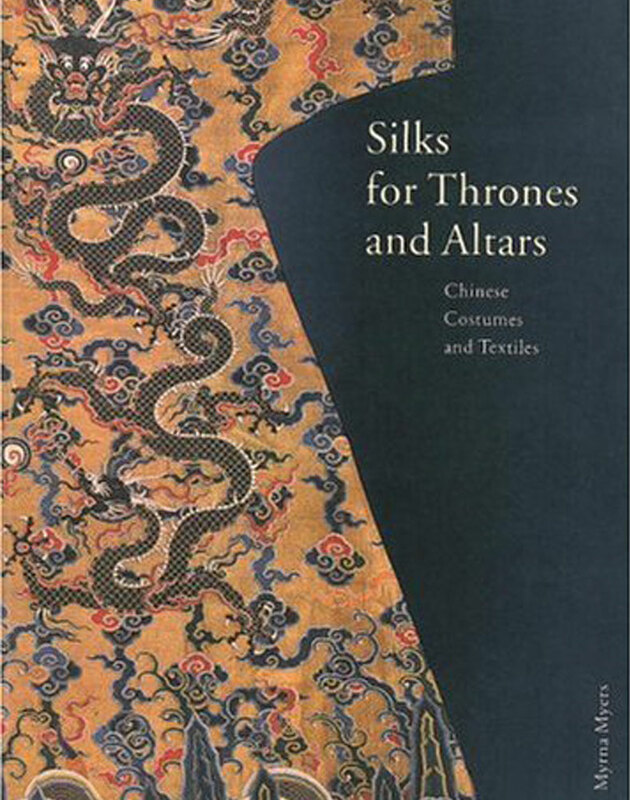 Mongol bain xian ao, or braided thread robe made of nasji, or silk and gold lampas, Yuan dynasty (1271-1368),Rossi and Rossi, London. 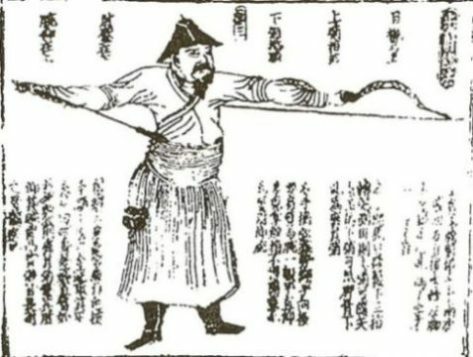 Mongol archer from Shilin Guangji (Comprehensive Record of Affairs) compiled by Chen Yuanling, for the 1325 edition. The shaped overlap also differed from those on Han Chinese robes that fastened with a single knotted button at the right neck opening near the shoulder line. To stay in place, Manchu overlap required loop and toggle buttons at the center front neck, right clavicle, under the right arm and along the right side seam. Detail, man’s embroidered silk silk semiformal court robe (jifu), mid-19th century, Metropolitan Museum of Art, Gift of Mrs. John H. Ballantine, 1947, C.I.47.11.2. When on display for ceremonial functions the cuffs communicated a strong message of identity, but otherwise, the cuff was frequently turned back to free the hand. This was particularly true for military class for whom skill in archery was essential. We frequently see the cuff on the left sleeve turned back to uncover the hand that held bow, insuring clearance for the fletching of the arrow. Detail, Unidentified artist (Chinese), Portrait of a fourth rank Manchu bannerman, hanging scroll, ink and color on paper, Qianlong period (1736-1795), University of Alberta Museums, Mactaggart Art Collection 2004.19.50. Horse hoof cuffs and a lute shaped front overlap held with loop and toggle fasteners remained a feature of Manchu dress until the dynasty collapsed in 1911. The shaped front overlap and the toggle fasteners continue to characterize contemporary qipao/cheongsam—the descendant of Manchu robes. 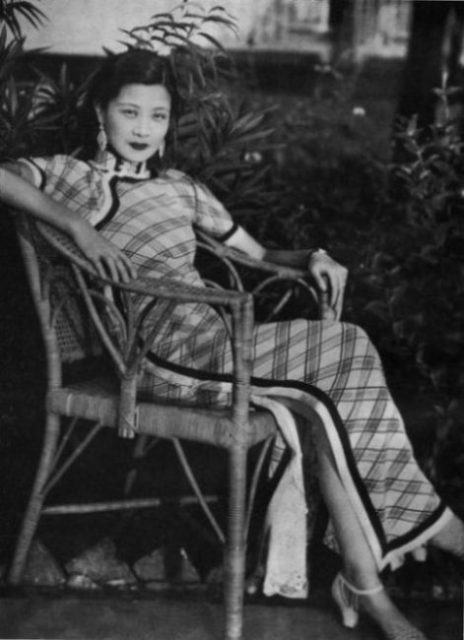 Photographer unidentified, Movie actress Ruan Ling Yu, about 1932, courtesy Vantage Magazine. Woman’s dress (cheongsam), silk crepe with embroidery, about 1930, Metropolitan Museum of Art, Gift of Sven E. Hsia, 1980.98.11. By mid-nineteenth century the tapered sleeve with its horse hood cuff evolved into a much wider form and with it the size of the cuff also increased, particularly on the formal celebratory coats worn by Manchu women at court. Embroidered silk gauze Manchu woman’s celebratory robe, mid- to third quarter 19th century, Courtesy Skinner Auction, Boston, Sale 2647B, lot 292, April 23, 2013. At this time we observe the practice of turning back the cuff to expose its lining. 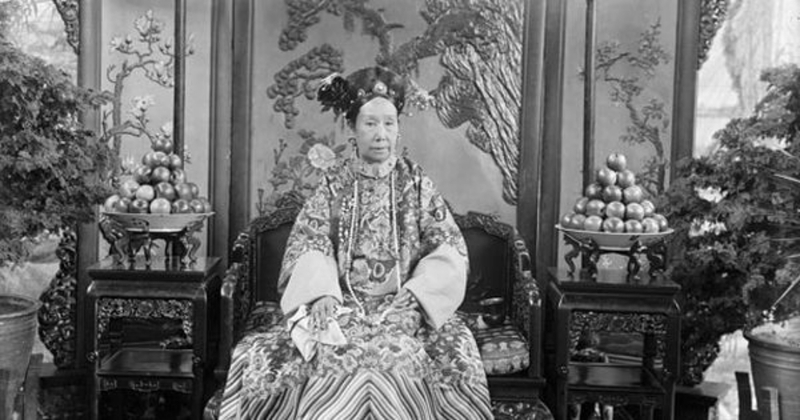 Xunling (Chinese, 1874–1943), Detail of portrait of Cixi, Empress Dowager of China, 1903, Freer Gallery of Art and Arthur M. Sackler Gallery Archives, Smithsonian Institution, Washington, DC, SC-GR-262. At the same time a fashion developed in Manchu women’s informal dress for wearing a cuff turned back twice. The first fold revealed decorative sleeve lining often in a contrasting color. the second fold exposed the decorative band facing the external sleeve edge. Detail Manchu woman’s unofficial robe, tapestry woven silk, about 1900, The Art Institute of Chicago, Gift of Guy H. Mitchell, 1932.38. A similar fashion for turning back a cuff on the wide sleeves of Han Chinese women’s coats also became wide spread. In isolation, this practice is remarkable, as there simply is no history of turned back cuffs on any East Asian upper body garment. 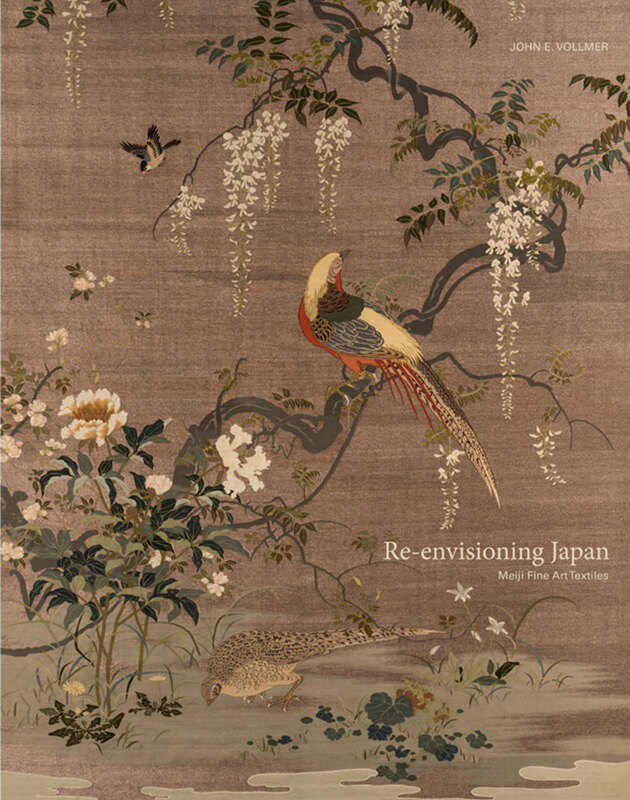 But, in the context of Western commerce and technological innovation, which increased rapidly during the nineteenth century, shifts in fashionable tastes should not surprise us. Imports of Western ribbons and dress trimmings, as well as a flourishing domestic production of a wide range of woven goods, including ribbons, tapes and other garment embellishments transformed the appearance of wardrobes of women and children. Since these are the garments most readily available in museum collections they have rather skewed what we think about Chinese dress. This researcher swallowed the 17th century propaganda about an equestrian martial heritage and spent years seeking the prototypes of these horse hoof cuffs and lute-shaped overlaps without success. The truth is, there is no pre-conquest dress to study. 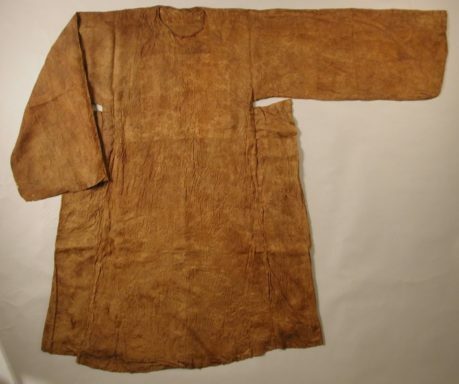 Examining the animal hide garments of related ethnic groups from eastern Siberia has not provided clear evidence either. With the adaptation of Mongol script in the late 1590s, the Manchus literally wrote themselves into existence by creating origin myths and divine ancestors. From the outset dress was an essential tool to underscore legitimacy and heritage, even if, as is quite apparent, it was largely invented during the first decades of the 17th century. Horse hoof cuffs, a curved front overlap on their coats and loop-and-toggle fastenings defined that identity, which eventually affected the dress of all populations in the widespread empire.